Unsweetened chocolate is the key to these homemade one-bowl brownies. 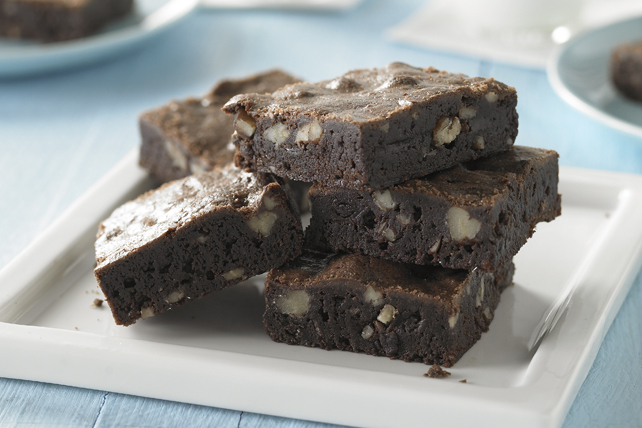 These brownies are fudgy and delicious - perfect for chocolate brownie lovers! Microwave chocolate and butter in large microwaveable bowl on HIGH 2 min. or until butter is melted. Stir until chocolate is completely melted and mixture is well blended. Add sugar; mix well. Blend in eggs and vanilla. Stir in flour and nuts. Spread into 13x9-inch pan sprayed with cooking spray. Prepare as directed, topping with 1 cup each Jet-Puffed Miniature Marshmallows and Baker's Semi-Sweet Chocolate Chips for the last 5 min. of the baking time.